Cortés, O., Dunner, S., Gama, L.T., Martínez, A.M., Delgado, J.V., Ginja, C., Jiménez, L.M., Jordana, J., Luis, C., Ooom, M.M., Sponenberg, D.P., Zaragoza, P., Consortium, B. & Vega-Pla, J.L. (2017) The legacy of Columbus in American horse populations assessed by microsatellite markers. Criollo horse populations descend from horses brought from the Iberian Peninsula over the period of colonization (15th to 17th century). They are spread throughout the Americas and have potentially undergone genetic hybridization with other breeds in the recent past. In this study, 25 autosomal microsatellites were genotyped in 50 horse breeds representing Criollo populations from 12 American countries (27 breeds), breeds from the Iberian Peninsula (19), one breed each from France and Morocco and two cosmopolitan horse breeds (Thoroughbred and Arabian). The genetic relationships among breeds identified five clusters: Celtic; Iberian; North American with Thoroughbred influence; most Colombian breeds; and nearly all other Criollo breeds. The group of “all other Criollo breeds” had the closest genetic relationship with breeds originating from the Iberian Peninsula, specifically with the Celtic group. 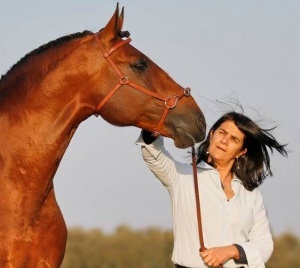 For the whole set of Criollo breeds analysed, the estimated genetic contribution from other breeds was approximately 50%, 30% and 20% for the Celtic, Iberian and Arab-Thoroughbred groups, respectively. The spatial distribution of genetic diversity indicates that hotspots of genetic diversity are observed in populations from Colombia, Ecuador, Brazil, Paraguay and western United States, possibly indicating points of arrival and dispersion of Criollo horses in the American continent. These results indicate that Criollo breeds share a common ancestry, but that each breed has its own identity.